Earlier this week, we filled you in on the biggest fall 2019 trends overall. Today, we're about to get a little more granular as we speak to the most important shoe trends for the coming season. There were a lot of heavy hitters for the season as far as footwear was concerned, but we're predicting our selections will generate a hefty following in just six month's time. Ahead you'll find your feel-good fall staples including croc, boots, and pumps, but not without some sort of twist. Designers stepped up their game (pun intended) in the footwear category this season, and the innovative trends ahead prove exactly that. Follow along as we walk you through the fall 2019 shoe trends we really need you to know about. As quite the shoe connoisseur myself, there's no way I have the personal restraint to read a trend story without shopping, which is why I included a pair of shoes within each trend that you can buy now should you want to get a head start on your fall shopping. I know I certainly do. From poppin' pumps to storm-stomping boots, everything you'll need to know about the coolest F/W 19 footwear is straight ahead. If there's one boot trend the sartorial world is boasting about for fall 2019, it's this one. The trend is focused more on the thick and chunky rubber sole of the shoe than the specific silhouette of the boot. While the Chelsea style was by far the most popular, we saw lace-up and wide-calf versions take on the rubber adornment as well. Did T-Pain inspire this shoe trend? Who's to say? But one thing is for certain—we saw fur of all kinds covering not only boots but a majority of the shoes that came down the F/W 19 runways. We saw shearling-lined over-the-knee boots at Celine and a fuzzy pump at Off-White, proving this footwear trend knows no boundaries. Looking for a way to spice up your look without overdoing it? This shoe trend is your answer. Designers surprised us by pairing brightly colored pumps with more subdued clothing, proving a great pair of shoes is sometimes all you need. Wear a yellow duo with one of your go-to office looks or a hot pink pair with jeans and a T-shirt—no matter which hue you choose, bright pumps are a step in the right direction. At first glance, these sort of embody the little foot covers you put over your shoes when walking on just-washed carpet or while in some sort of medical unit. But the more you stare at them, the cooler they become. If you disagree, well, we're sorry because this is a notable trend for fall 2019. Rejina Pyo portrayed the trend elegantly via a subtle cinching effect while Toga took a more literal approach to the elastic detailing. We can't wait to see more iterations of this forward-feeling shoe trend come next season. Would it even be fall without a plethora of croc-embossed accessories? The answer is no. 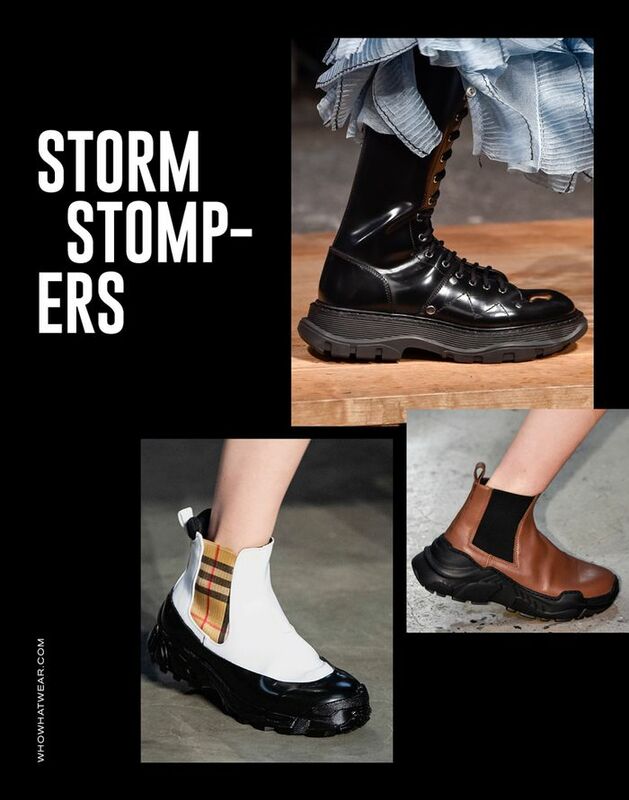 Be it a loafer, strappy sandal, or knee-high boot, croc kicks were sprinkled all over the fall runways thanks to designers of varying aesthetics such as Marni, Erdem, and Loewe. This textured leather is often times just the thing a fall ensemble needs to add a bit of luxury, polish, and now, trendiness as well. Square toes are all we can think about right now. For fall 2019, the square-toe boot will surely reign supreme since, as we all know, boots are a must-have seasonal wardrobe staple. However, we saw incredibly fresh versions emerge from keynote designers, including Bottega Venetta's pieced-together pump. No matter which shoe shape you choose, just look out for a geometrical toe and you'll be set. The Mary Jane is officially back. For a while, this style felt dated and tired (don't @ me), but after seeing the trend paired with lots of lace at Versace, tacked on to a bold thick heel at Hermes, and worn with coordinating hosiery at Dolce & Gabbana, we're sold on the idea of wearing them all season long. This season, when it comes to boots, the taller, the better. The F/W 19 runways proved the sky is the limit as far as boot height is concerned, as thigh-grazing shoes covered the limbs of models from New York to Milan and back again. This boot trend might seem unapproachable at first glance, so if you're stressed about how to style it, start by layering a pair under a midi dress or skirt versus over a pair of jeans. Up next, discover the biggest fall 2019 ready-to-wear trends.